We had to go to L.A. unexpectedly on Monday and before hitting the road I made breakfast to go. Oatmeal for myself and, because I was feeling generous, and egg sandwich for Martin. There was plenty of time to cook both while we showered and loaded up the car. I also took a few Sun Oven muffins out of the freezer for a midmorning snack. A solar cooked breakfast is at least a million times petter than drive thru. I guess my failed chicken and rice at the Bisbee cook-off last weekend left me with a craving because that's all I could think of making today. We were both quite tired today, the L.A. trip was all work, so a one pot meal was perfect. I took a cup of brown rice, a cup of water, chopped vegetables that I had on hand - leek, carrot, cabbage and butternut squash - put the chicken thighs seasoned with salt and pepper on top and put it in the Sun Oven for about two hours. It made a complete meal with leftovers. I only wish it had come out this good for the cook-off. And on a final note, for anyone keeping score, I did cook something last Sunday, the day after the solar cook-off in Bisbee. Once again I was pretty tired, exhausted would be a better word for it. I spent the better part of the day on the couch and it wasn't until late afternoon that I dragged myself into the kitchen to see what I could throw together. The fridge was pretty bare and time was running out. It would have to be breakfast for dinner, bacon and eggs, one of Martin's favorites. Enjoy your blogsite immensely! 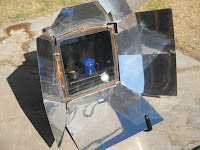 I'm learning alot about the Sunoven and solar cooking. 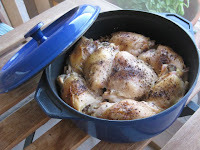 What pot did you use for the chicken? It looks heavy like a Le Cresuet. I thought only the thinner, lightweight pots would cook well. Can you clarify this for me, please? Yes, it is a heavy cast iron Le Cresuet type pot. They work just fine in a Sun Oven, but not so well in other solar ovens. The cooking times will be slightly longer, but your food will also stay warm longer. They're perfect if you like to enjoy your dinner a little later in the evening. Just leave it in the Sun Oven, it will stay warm for at least an hour after the sun goes down. At the cook-off in Bisbee almost everyone was using cast iron. Sharlene - It was an early dinner, but I did start late. 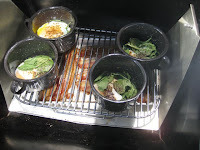 Bacon cooks in about 40 minutes and as you well know eggs are done in twenty. I think I started it around 4 p.m.